To determine the best hot flash remedies let's look at the possible causes of hot flashes. Our liver has over 500 functions. How to check if your liver is congested? After a meal drink a cup of hot water with the juice of 1/2 lemon. If you feel better there's a good chance your liver is either weak or overworking. lose weight with detox and natural detox remedy. 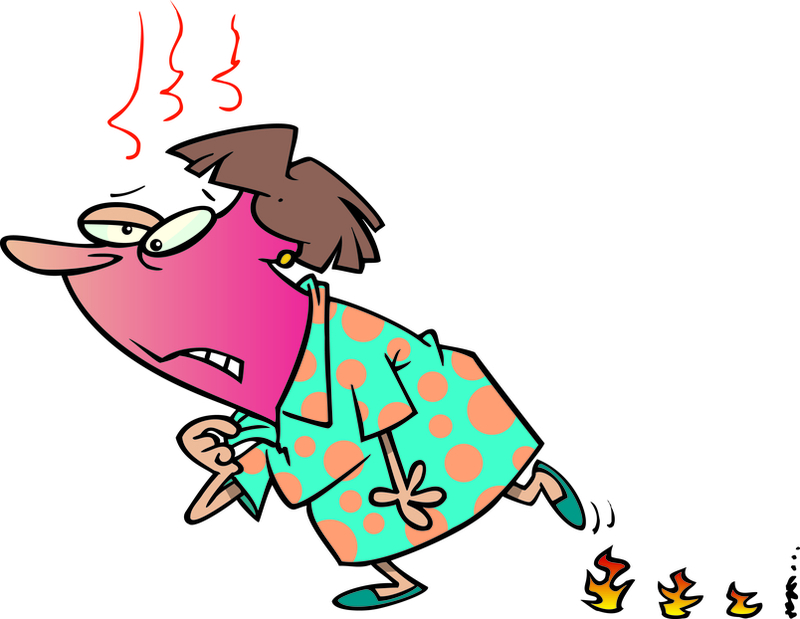 Many of our ailments are stress-related and hot flashes are no exception. One of your hot flash remedies must be to learn how to better handle stress or reduce stress. It is simple to have your thyroid TSH levels checked by your Doctor to see if your thyroid is functioning as it should. The hormones secreted by our adrenal glands work to handle stress and recover from stress - the fight or flight response. They also regulate appetite and energy levels, and help the body resist the stress of infections and maintain stable emotions. Those that reach the point of burnout at work have exhausted adrenal glands. If you have lived a highly stressful life you could be entering menopause with your adrenals in a state of exhaustion. A high quality complex B vitamin is calming as well as extra B5. Pure and simple is the key. Sage: caution, do not use sage if you suffer from any type of seizure disorder. By determining the causes of your hot flashes and using these natural remedies for hot flashes you can make the necessary changes you need to. With proper diet and nutritional supplements most of your menopausal symptoms can be minimized or eliminated. "My hot flashes started in 2001 and were unbearable. My sheets would be soaking wet every single time I slept, whether at night or even during an afternoon nap. My hot flashes happened all the time. I hardly wore a winter coat, the lighter the better! I could not wear anything with long sleeves or with wool. I did not want to take hormone replacement therapy because there is a history of cancer in my family, lung, stomach and breast. I was really left with nothing to do but suffer. Opening windows in winter, installing A/C in the summer were my only solutions, that is until I met Sue-Anne. She recommended that I do a simple cleanse with a product that would help my liver. I started taking it and my hot flashes disappeared! I must tell you that the results are fantastic: After 13 years, no more hot flashes! Thank you so much Sue-Anne for your advice." Contact me to learn how you can eliminate your hot flashes completely. There is no need to suffer! menopause herbal treatment for more natural treatment for menopause.